Is it November 2014 yet? Because that's when the third movie in the franchise based on Suzanne Collins' best-selling novels is due for release — an impossibly long wait for those of us ready to keep watching as The Hunger Games: Catching Fire came to its climactic close. Yes, it's that good. 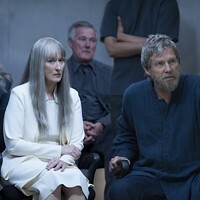 Bucking the laws of diminishing returns when it comes to sequels, it's even better than last year's The Hunger Games, itself no slouch in the entertainment department. Picking up where the first film left off, with Katniss Everdeen (Jennifer Lawrence) and Peeta Mellark (Josh Hutcherson) back at home in District 12 after winning the 74th annual Hunger Games (sorry, series newbies will have to catch up on their own), there are all sorts of problems brewing on the local and national scenes. Katniss' main squeeze, Gale (Liam Hemsworth), wants to believe that her heart still belongs to him, but he's bothered by her actions during the competition, when she convincingly made it look like she loved Peeta in an effort to save both their lives. Peeta, for his part, doesn't appreciate the brushoff she's given him since returning home, and he mopes around as only the puppyish Peeta can. Meanwhile, in the Capitol, President Snow (Donald Sutherland) senses in Katniss the spark needed for a revolution among the populace, and he employs ominous threats against her loved ones to get her to cooperate. 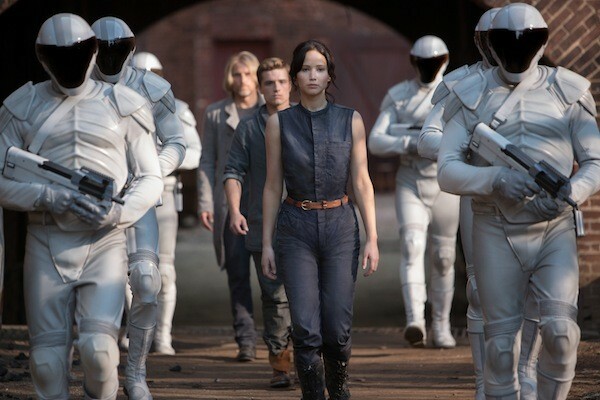 She agrees to be a complacent winner, smiling wanly at the throngs of crowds as she and Peeta make their way through the requisite victory tour, but Snow remains unconvinced. 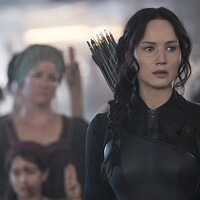 So at the urging of the latest Games designer (a slippery Philip Seymour Hoffman), the prez decides that it's back to the killing fields for Katniss and Peeta, with their new allies and enemies coming in the form of the cocky Finnick (Sam Claflin), the volatile Johanna (Jena Malone), the soft-spoken Beetee (Jeffrey Wright) and other past winners like themselves. One of the aspects that makes Catching Fire stronger than its predecessor is that it possesses a more palpable sense of danger. For all the kid-on-kid brutality in the first film, it truly felt like a "game," as these teens and preteens ran around the forest picking up skills while picking each other off — you could almost envision a Parker Bros. board game (and, sure enough, there is an import titled The Hunger Games District 12: A Game of Strategy). But in this latest film, the tension is heightened on every front. As again portrayed by a chilling Sutherland, President Snow is a deadly adversary, far more threatening than anything the Hunger Games can conjure up (be it the wasps in the first film or a tidal wave in this one), and his malevolent presence hangs over all 12 districts like a poisonous fog. Director Gary Ross had some trouble providing enough pop to the initial film's action set-pieces, but new helmer Francis Lawrence (no relation to Jennifer) has no such trouble, another factor that makes this film feel weightier. 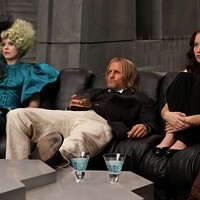 As for the cast, everyone's back and accounted for, from Woody Harrelson as the boozy mentor Haymitch Abernathy to Elizabeth Banks as the ditzy chaperone Effie Trinket to Stanley Tucci as the unctuous TV host Caesar Flickerman. 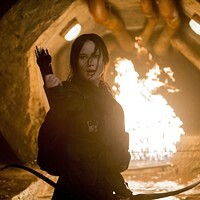 Still, despite all this high-powered talent, it's Jennifer Lawrence who holds our attention throughout the film. Katniss Everdeen makes for a fantastic heroine, and her appeal is only accentuated by the intuitive and commanding work by Lawrence in the role. Aside from the occasional Heath Ledger, tentpole pictures aren't generally remembered for powerhouse performances, but with Lawrence able to draw on the hardscrabble qualities that informed her Oscar-nominated turn in Winter's Bone and the deep wells of emotion that earned her the statue for Silver Linings Playbook, the Hunger Games franchise is ably demonstrating that it's hardly malnourished when it comes to uncorking the acting fireworks.